The flowering Kwanzan cherry (Prunus "Kwanzan") bears lush pink flowers in the springtime. Not native to the United States, this tree grows in hardiness zones 5 to 9. Kwanzan cherry trees can be propagated via grafting of wood clippings. 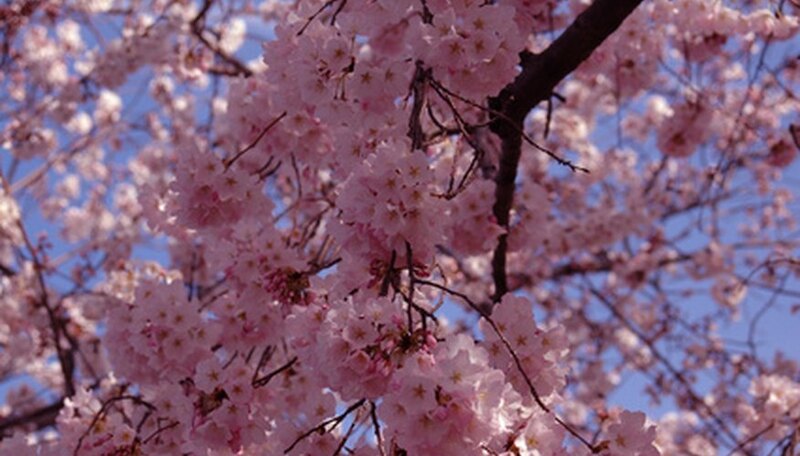 Take clippings in the late spring to early summer to root them and create new Kwanzan cherry trees for your garden. This process is not difficult, but cuttings do take time to root and the success rate is not 100 percent, so take more than you need. Wait until the new growth on your Kwanzan cherry tree just begins to harden, typically between May and July. This is the best time of year to take softwood cuttings, which root very quickly. Since the weather is cooler, early morning is the best time of day to take cuttings. Inspect the branches of your Kwanzan cherry, noting new growth that's just begun to harden. Find shoots that have both large and small leaves, since this leaf gradation is a sign of wood suitable for softwood cuttings. The wood should snap easily when bent, another sign that it's the correct age for cuttings. Take several cuttings with a sharp pocket knife, making each 4 to 6 inches long. Not all cuttings will root, so take a few extra. Strip the leaves from the bottom third of the cuttings with your fingers. Place one Kwanzan cherry cutting in a 4-inch pot filled with equal parts peat and sand, so that 1/3 to 1/2 of the cutting is beneath the soil mix. Plant all cuttings in this manner to root them. Cover each pot with a plastic bag, securing the bag to the pot via rubber band. Place the pots in an area where they receive indirect light until the cuttings root, within a couple weeks at the earliest.